Early in Kate Fraser’s medical career, she worked as a resident at the Crichton Royal Lunatic Asylum, as the Dumfries hospital was then known. It was this experience which inspired her to commit herself to improving the conditions and treatment of the mentally ill.
She founded a Mental Welfare Association in her home town of Paisley in 1907, which was the model for the Scottish Association for Mental Health (1920), on whose board she was a long serving member. She became in 1914 the first woman Deputy Commissioner on the General Board of Control for Scotland, after the Mental Deficiency Act of 1913 permitted the inclusion of women in that body, and she became a full Commissioner in 1935. She emphasised the importance of the relationship between the mentally ill and the community in all her work. "Throughout her life, often as a pioneer, she devoted the zeal of the "Fighting Frasers," to whom she was proud to belong, to the service of the mentally ill and handicapped with insight, sympathy, and courage." 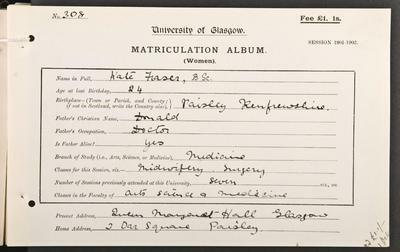 Fraser specialised in child psychology and in 1908 was the first woman School Medical Officer for Govan. 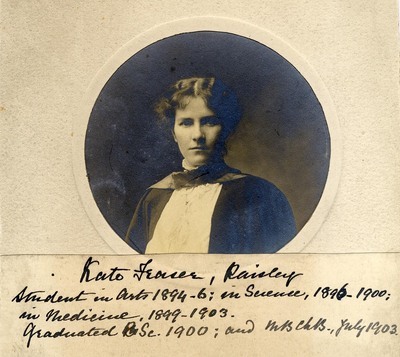 Following on her research work in Vienna and Paris, she pioneered the use of Binet-Simon intelligence tests in the United Kingdom with her research into syphilis related mental deficiency in Glasgow in 1913. She retired from her role as Commissioner of the General Board of Control for Scotland in 1947 and took up a new position as chair of the Scottish Association for Mental Health. Mayes. M. 1995. The stormy petrel, A life of Kate Fraser, CBE, MD, BSc, DPH 1877-1957. University of Glasgow: Wellcome Unit for the History of Medicine. Obituary. The Times 21 March 1957. Rights of the mentally ill are included in Disabled Persons Employment Act 1944. Kate Fraser, a pioneer of mental health, ensured that the mentally ill were included in the provisions of the Disabled Persons Employment Act 1944. World Changing Project, "Pioneering work for the rights of those with mental health issues," in University of Glasgow World Changing (University of Glasgow, 2010); http://www.worldchanging.glasgow.ac.uk/article/?id=50 (accessed April 23, 2019). World Changing Project. "Pioneering work for the rights of those with mental health issues." In University of Glasgow World Changing. University of Glasgow, 2010. http://www.worldchanging.glasgow.ac.uk/article/?id=50 (accessed April 23, 2019). World Changing Project. "Pioneering work for the rights of those with mental health issues." University of Glasgow World Changing. University of Glasgow, 2010. 23 April 2019 <http://www.worldchanging.glasgow.ac.uk/article/?id=50>.